One Verse Wonders are different from One Hit Wonders. 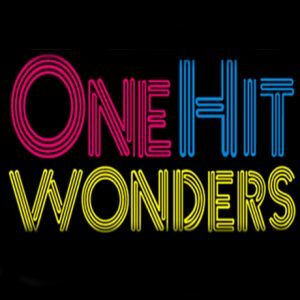 One Hit Wonders are one and done, and never heard from again. One Verse Wonders have had a lasting impact. They’ve rippled and reverberated throughout history and have helped shape our faith and the lives of countless Christians. The verses we’re going to study are worthy of our awe and wonder. Of course, every verse has its context, so we’ll have to look at more than one sentence, but our focus will be on one verse each week that encapsulates a beautiful spiritual truth. Let’s look at Paul’s letter to the Galatians, Ch. 3:23-29. Now before faith came, we were imprisoned and guarded under the law until faith would be revealed. Therefore, the law was our disciplinarian until Christ came, so that we might be justified by faith. But now that faith has come, we are no longer subject to a disciplinarian, for in Christ Jesus you are all children of God through faith. As many of you as were baptized into Christ have clothed yourselves with Christ. There is no longer Jew or Greek, there is no longer slave or free, there is no longer male and female; for all of you are one in Christ Jesus. And if you belong to Christ, then you are Abraham’s offspring, heirs according to the promise. Our One Verse Wonder today is Galatians 3:28. We’d be hard-pressed to find in the Bible a more radical, counter-cultural passage than this one. Ancient Greeks divided the world into two categories – Greeks & barbarians. Ancient Jews divided the world into two categories – Jews & Gentiles (“Greeks”). Each one viewed their race as superior. Free persons certainly had a leg up on slaves. And in the ancient world, men viewed women as inferior, and in many cases they were treated as property. Paul says, If we belong to Christ, we need to change all that. We can’t look at people that way. There’s an old Gospel song, “The Ground is Level at the Foot of the Cross.” We’re all the same as we stand before a Holy God and marvel at God’s Love. Vs. 27: As many of you as were baptized into Christ have clothed yourselves with Christ. 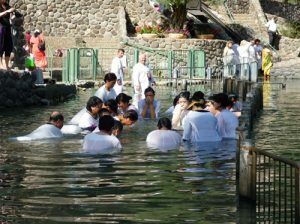 There was a tradition back then that is still done today, where those being baptized would wear white robes, symbolizing putting on the purity of Christ, taking on a new nature, a new outlook, a new look. Paul says, when you put on Christ you have to look at the world differently. You have to look at people differently. You have to look at them through the eyes of God. And when you do, everything changes. The old divisions fade away. And the need for oneness, and equality and dignity for all come into focus. 1. There is no longer Jew nor Greek. Ethnic divisions and hostilities are unacceptable in God’s Kingdom. One race is not superior to another. As Genesis Ch. 1 clearly states, All people are made in the image of God. Genesis 1:27 – “So God created humankind in his image, in the image of God he created them.” Ethnicity should not divide us. We’re one in Christ Jesus. As a footnote to this sermon I’d like to remind us that America was also not founded on race. America wasn’t just for one group of people. It was founded on the principle that All Men (and eventually All People) are created equal. And so this resurgence in White Nationalism is not only anti-Christian, it’s also anti-American. 2. There is no longer slave or free. St. Paul laid the groundwork for the abolition of slavery with this statement. He made the same point in his Letter to Philemon, found in the New Testament. In God’s Kingdom there is no longer slave or free. We are one in Christ Jesus. 3. There is no longer male or female. The Apostle Paul often gets criticized, understandably, for some things he wrote about women needing to keep silent in the church. (found in I Corinthians 14:33-35 and I Timothy 2:9-15) However, those passages were written for churches that had become chaotic. So it’s not a stretch to view Paul’s restrictions as specific to those churches at that time period in the development of the church. Sometimes in scripture we have to discern between teachings that are historically specific vs teachings and truths that are for all time and places, such as Gal. 3:28 – “In Christ there is no longer male or female.” That’s for all times and all places! It’s also quite possible that Paul may have evolved in his thinking on the subject and changed his mind. Not only is this verse in Galatians evidence of that, but also in Paul’s Letter to the Romans. In the final chapter (Ch. 16) he closes by greeting and thanking ten women, whom he calls his “co-laborers in the Lord” and who risked their lives along with him for the sake of the Gospel. He calls Phoebe, a Deacon in the Lord. He calls Junia, an Apostle of the Lord, “prominent among the apostles” (Rom. 16:7). Apostles were those sent out to start new churches. That’s the same title that was given to Peter, James and John, and Paul himself. The four different commentaries I looked at this week mentioned a morning prayer that was prayed by Jewish men during this time. “Lord, I thank you that I am not a Gentile. I thank you that I am not a slave. Paul clearly, intentionally and forcefully confronts, rebukes and corrects that prayer! This is a wondrous verse that speaks as forcefully today as it did when Paul first wrote it. Let me close with one final thought and then a brief story. Paul believed that the love of God could break down any wall of division. I realized this week that I’ve experienced what Paul talked about, and it relates to our Open & Affirming discussions today. I’ll tell you about it just briefly. I grew up in a very conservative area in Pennsylvania, surrounded by Mennonites & Baptists and a church on every corner. I never had a friend who was openly gay or lesbian until I moved to New England in my mid 30’s. And I met my first LGBTQ friends in church, as their pastor! It became clear rather quickly how much we had in common. We all loved the same passages and the same hymns! We loved worship and prayer; we loved our God and our church! There was one person I served with and got to know who struggles with gender identity, (known as “gender fluidity”). Some days this person wakes up and feels like a woman, and other days she wakes up and feels like a man. And you can see how she’s feeling by the clothes she wears that day. I can’t begin to tell you what a stretch that is for me to try and understand that, and how foreign that is to my life experience. And for a while, whenever I saw this person, which was quite often, that’s almost all I thought about. But as the months and years rolled by, we became friends and not just a straight man and a lesbian woman with gender fluidity. I saw her beautiful faith and the gifts she brought to the church. And if my friends from Pennsylvania had seen us singing that duet, they would have fainted. But if they’d close their eyes, they would hear the music of heaven. For in Christ the differences and divisions melt away. 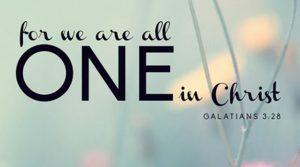 For we are one in Christ Jesus. Listen to this amazing verse one more time.